Music Week Joins The MPG Benefactor Scheme! Full and Associate Members of the MPG can enjoy a 30% discount off either a Premium (Print & Digital) or Digital Only subscription to Music Week. For over 50 years, Music Week has held its spot as the leading trade media brand for the UK industry in print, in person and online. Essential reading for anyone who needs to understand the business of music, from vinyl to streaming, from the Dublin Castle all the way to Wembley Stadium, Music Week covers industry news as and when it happens, as well as providing exclusive editorial content from our team of award-winning journalists. Our events include the annual Music Week Awards, Women in Music and SYNC Awards, and are widely regarded as ‘must attend’ by the leading industry execs. 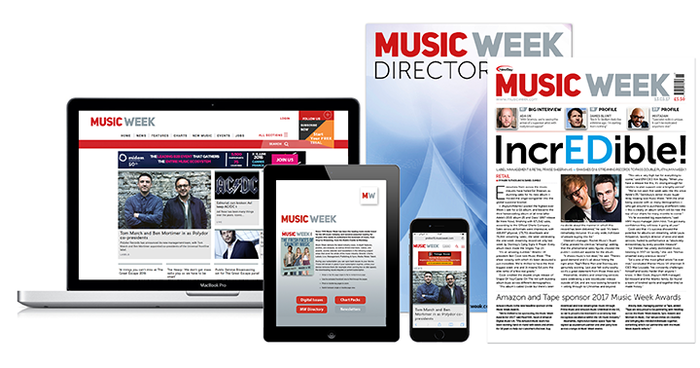 An annual subscription to Music Week includes: complete access to musicweek.com; print or digital issues of Music Week magazine; a range of news alerts on the subjects that matter to you and the Music Week app in either ios or Android. All available to Full and Associate Members of the MPG at a 30% discount! If you are a Basic Member and wish to upgrade to Associate or apply for Full Membership please log-in to the MPG website.